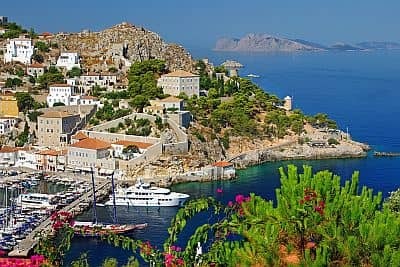 The Saronic islands are situated in the gulf of the same name, between Attica and Argolis (the latter belonging to the Peloponnese peninsula), and have a Mediterranean climate, with mild, moderately rainy winters and hot, sunny summers. 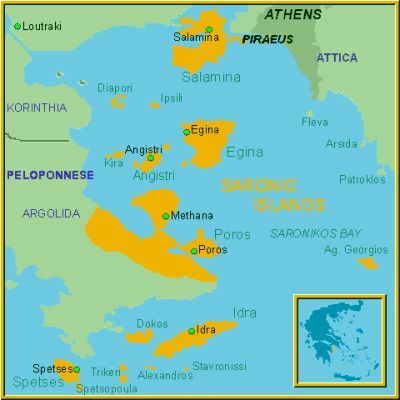 They are, in order of size: Salamis (the largest and only a short distance from Athens), Aegina, Hydra, Poros, Spetses, Dokos, and Angistri. Here are the average temperatures in Hydra. The rains are not abundant, since they amount to about 500 millimeters (20 inches) per year on the coasts and at low altitudes, and follow the Mediterranean pattern, in fact they are concentrated in the cold half of the year. In summer, it almost never rains, although sometimes a thunderstorm coming from the continent can reach the islands. Given the length of the dry season, the landscape is semi-arid, though it is greener in inland areas, where there are hills; the highest point in Hydra is Mount Eros, 592 meters (1,942 feet) high. This is the average rainfall in Hydra. Winter, from December to mid-March, is quite mild: daytime temperatures hover around 12/14 °C (54/57 °F). The rains are frequent, but there are also sunny days. Cold air masses from the north can lead to cold periods, with highs below 10 °C (50 °F); moreover, the wind can increase the feeling of cold. Spring, from mid-March to May, is mild, and over the weeks it becomes progressively warmer, sunnier and less rainy. Summer, from June to mid-September, is hot and sunny. The Meltemi, the wind from the north-west, blows from mid-May, cooling the air, but less often than on the central Aegean islands. Typically, the maximum temperatures remain around 30 °C (86 °F); occasionally short periods of intense heat can occur, with highs around 36/38 °C (97/100 °F). Autumn, from mid-September to November, is pleasantly warm and often sunny at first, then it gradually becomes milder, while the rains become more frequent. The amount of sunshine on the Saronic islands is great in summer, when clear skies prevail, and it's very good in spring, while in autumn and winter, sunny periods alternate with others characterized by clouds and rain. The temperature of the sea is warm enough for swimming from July to September, when it reaches 24 °C (75 °F). In June, it is still a bit cool, about 21 °C (70 °F). The best time to go to the Saronic islands for a beach holiday is the summer, from June to mid-September. In June, as mentioned, the sea is still cool. It's better to bring a sweatshirt for cool evenings, which occur mostly in June. In May, not only the sea is still a bit cold, but also the air can be cool for sunbathing, at least on certain days. If you want to go on excursions on the islands, you can choose the spring, for example in May, or maybe the first half of October, since in summer it is sometimes very hot.